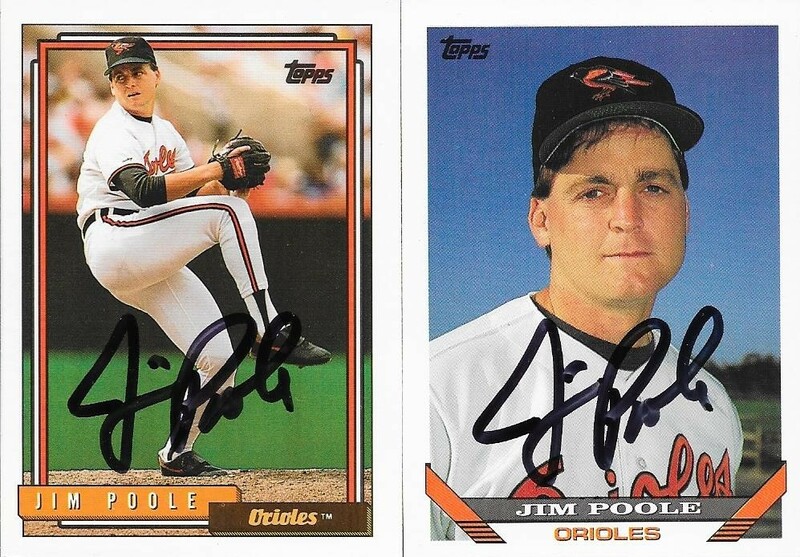 I received a TTM success today from former Orioles reliever, Jim Poole on some pretty nice cards. The above 1988 Topps Traded Team USA card came out of a box of Topps that my mom found for me a while back. The 1994 Flair came from another box that she picked up at the same time. Those 1994 Flair cards turn out really nice when they are signed. 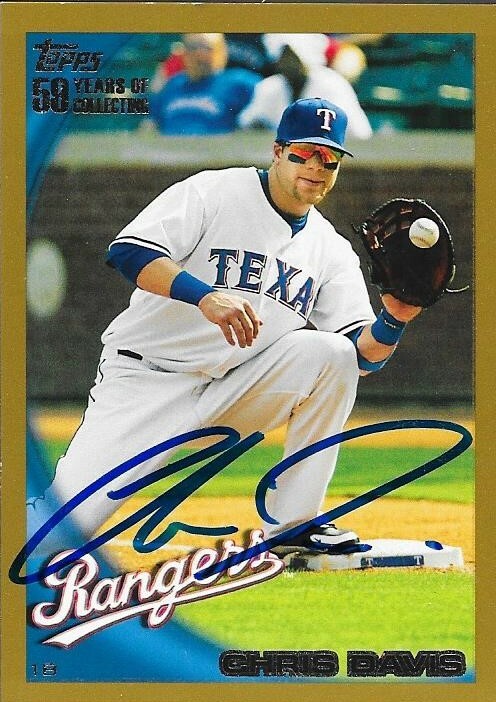 This one looks nice, as well, even though the signature bubbled up somewhat. 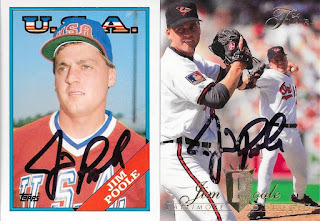 Here are two Topps cards (1992 and 1993) for the Topps Autograph Project. I now have 5 each from those two sets (and am always looking to add more). This last card comes from the Official 1987 USA National Baseball Team set. The card was in a random box of cards that my wife picked up for me several years ago as a Christmas present. I put the box up, and took a look through it some time ago for TTMs. 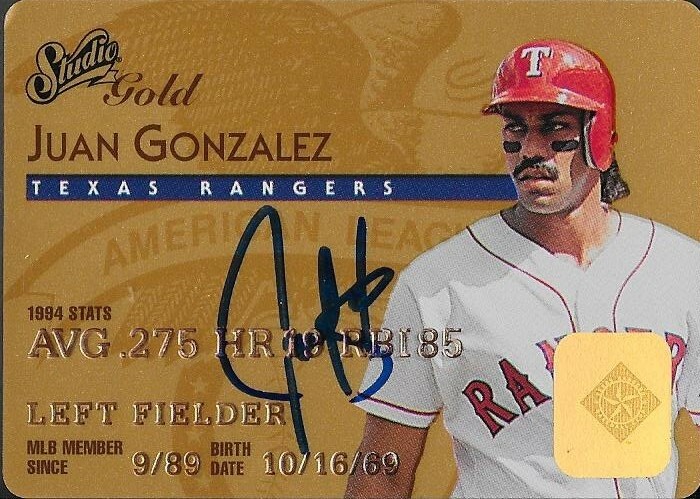 Realizing I had this card, but no real purpose for it, I figured it would be a nice add-in for some player who signed TTM. Now, the card has a purpose and will reside in my TTM/IP Autograph album, as opposed to being just some random card in a box somewhere. Poole (b. 1966) played in the majors from 1990 to 2000 for the Dodgers, Rangers, Orioles, Indians, Giants, Tigers, Phillies and Expos. He had a career record of 22-12 with an ERA of 4.31 and 256 strike outs. I mailed to Poole on October 24 and got the card back today for a 7-day TAT. 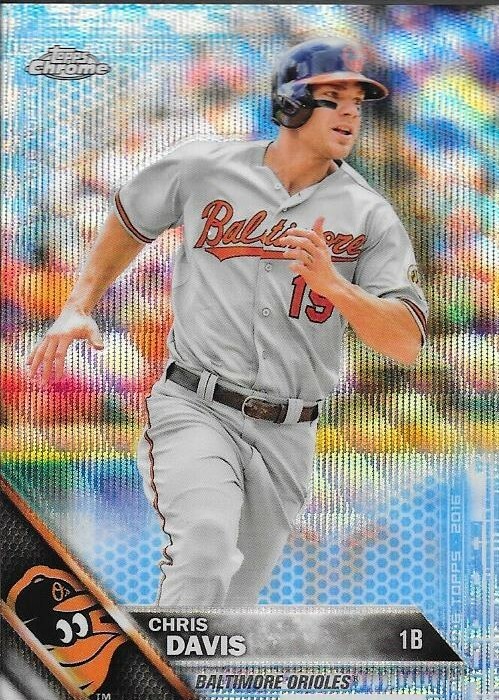 I saw a few deals recently on Ebay for some Chris Davis 2016 Chrome parallels. I decided to go ahead and pick a few of them up, and the first one to roll in was this blue wave refractor numbered 71/75. 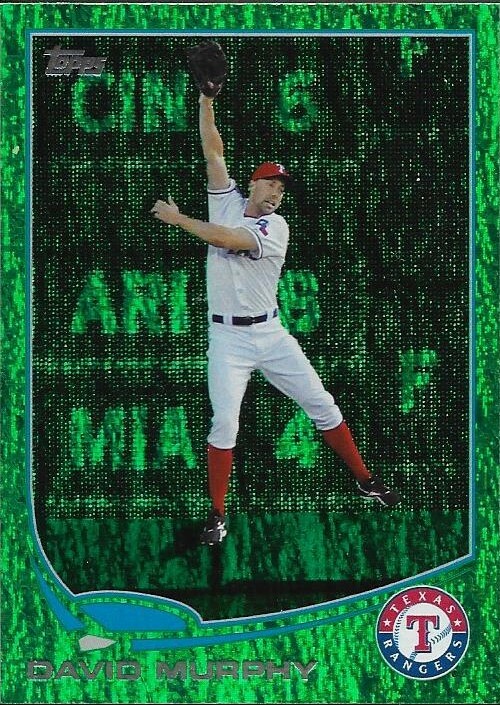 It's a really nice card; I have always liked the wave refractors. The card didn't cost much at all and will be nice in the Davis PC. 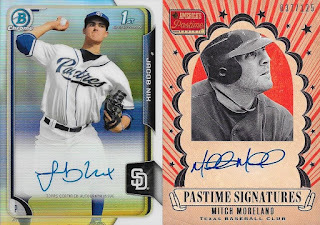 I'll keep trying to get the parallels as I can, but I highly doubt I will be able to get the rainbow. 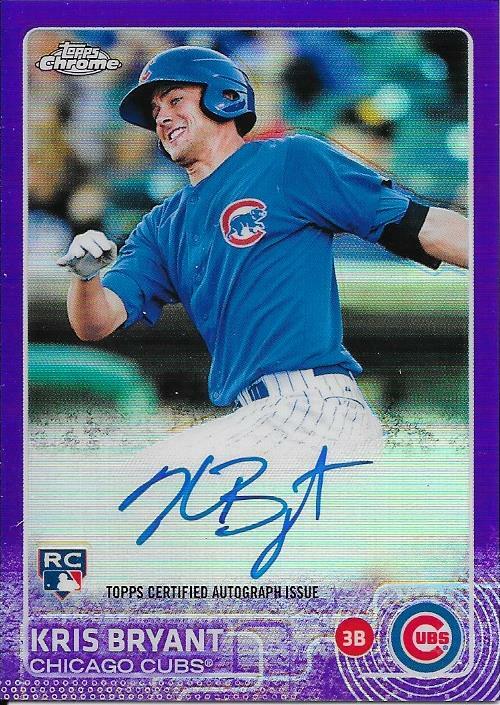 Still, no rainbow is as nice as 2014 Bowman. That was such a nice set, especially combined with 2014 Bowman Chrome. The Orioles were bounced pretty quickly from the playoffs, but the days leading up to that moment were some of the most exciting and tense days that I remember as a fan. The Orioles squeaked into the Wild Card Game after a sub-par August. Their September was much better, and they got in. Only to lose to the Blue Jays. 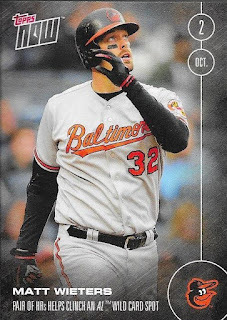 Topps issued a few Topps Now cards to commemorate the moments from the last day of the season when Matt Wieters hit two home runs against the Yankees in Yankee Stadium to punch their ticket to the post season. I bought the clincher card and also the Wieters, since he is likely to leave once he becomes a free agent after the World Series is over. I wanted to get a few of his cards that they are finally issuing. Before the Wild Card Game, I spent the $49.99 for the "If The Os Win Then You Win" playoff set. Little did I know, they didn't win. Oh well. The set is nice, albeit over priced. It would have been great if they had gone farther, then I would have been able to have cards added to the set. It does provide for a new Davis for the PC, so it's not a total loss. Although my birthday was a month and a half ago, a few care packages have still come in to commemorate it. One such package was from my good friend, Zach, whom I have sincerely enjoyed getting to know over the last few months. Zach is a really nice guy from California who I have been helping with his Chris Betts PC and also sending him some Mike Trout and Red Sox cards. I have really enjoyed helping him grow his collection. 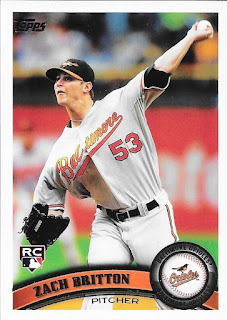 He sent me some nice Orioles cards for the PC, one of which is the above 2011 Topps Zach Britton RC. Britton has a strong shot to be named the AL Cy Young Award winner, which would be a really awesome accomplishment. He had an amazing year, and I hope the award seals it. 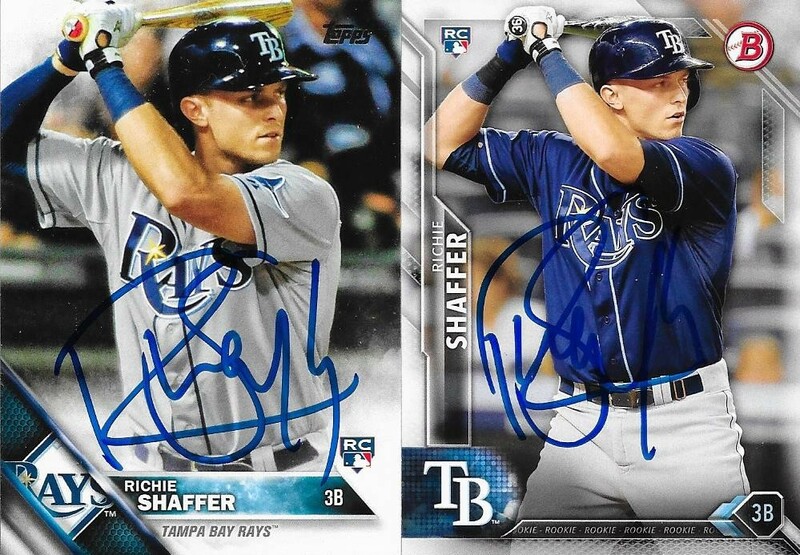 Zach also included these two autograph cards. I honestly haven't heard of Jacob Nix but I do know who Mitch Moreland is. However, both cards are really nice, and I appreciate Zach sending them along. Thank you so much for the birthday gift, Zach! I try to keep my blog posts positive, especially when I am discussing trades and deals with fellow collectors. Most deals end well, I'd say 99.9% of them do, but sometimes, you learn from doing a deal with someone that you are better off declining them in the future. This leads me to today's post. On September 6, I paid a guy I know from Facebook and Instagram a sweet price for a Jonathan Schoop bobble head and another bobble head. He was desperate for money, and after I initially declined his offers for the items, he finally lowered the price to something I just couldn't pass up and I reluctantly said we had a deal. He was even going to throw in an OMLB ball that I had sent him to graph with, but never ended up using. Subsequently, communication stopped after the Paypal payment (friends and family, of course) and I wasn't informed that the stuff had shipped in the days that followed. I messaged him a couple times about a week later to see if he had shipped yet and I got no response. Finally, he asked me for my address on September 19 and apologized for taking so long to ship. A couple weeks went by, and still nothing, so I sent a couple messages to see what was going on, and they weren't even opened. I kept my cool, but I was obviously frustrated, so I finally messaged him on every platform I had followed him on and said that he could just refund me the money and not worry about shipping the goods. I wanted to end the deal amicably, since I still believed we were friends. Within a minute of sending the message to refund me the money, he said that his mom had forgotten to ship. He said on October 6 that he was sending extras to make up for the slow shipment. Finally, on October 23, I got the package. Inside the package was the stuff I bought, in good shape, yet, the OMLB wasn't there. He did add a bag of autographed cards to the shipment, I guess to make up for everything, but has not actually sent me any kind of message since October 6. I was never rude at all in the transaction, but my thought was that with the ignoring of messages and lack of communication, we probably weren't as good of friends as I thought we were. That's a real bummer, but honestly, it probably is for the best. I've known the guy since I started on Instagram, but we have only completed one trade, and it went just as poorly as this one. I tried to let things go and not let it bother me, but I will not be trading with him any more. I don't think it will be an issue, since he pretty much stopped talking altogether. That's a real shame. So, here are the IP autos that he sent along. 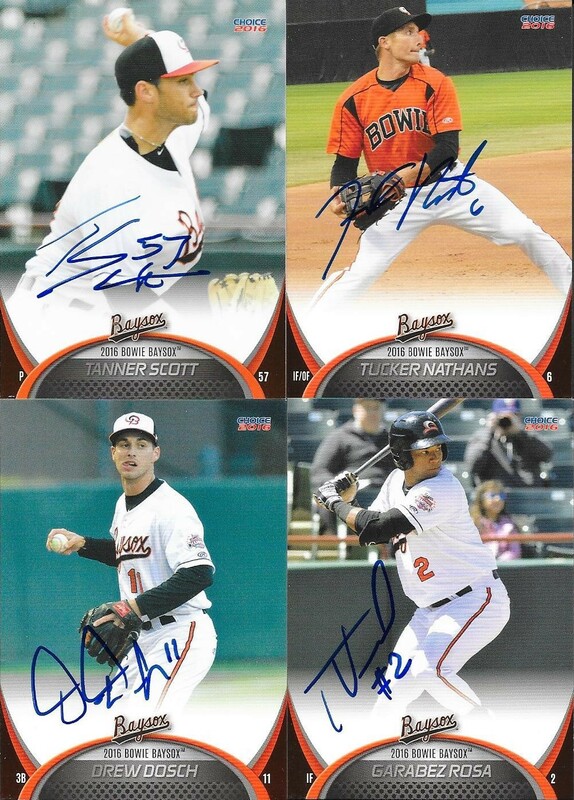 These are all guys in the Orioles minor league system. Some of them are more promising than others, but they're all nice. I'm particularly interested in Tanner Scott, for sure, since he is a lefty and can top 100+ MPH. This Juan Yepez from 2016 Bowman Chrome is a nice card, as well. I don't know what I'm going to do with it, but it is nice, nonetheless. Finally, this Bowman Platinum Jonathan Singleton relic auto is also a nice card. I have an idea what I'll be doing with this, so we'll see. I just feel bad about this whole deal, though. With the nominal amount that I sent him, I really shouldn't complain, but I think the lack of communication at all was a slap in the face. I even thought about sending him some additional money via Paypal to cover the cost of shipping, but then I thought that if it really were that important to him, he would have at least messaged me a lot more than he had been. The fact that this was the second time this has happened with the same person tells me that I will not be doing any kind of deals with him again. It's really sad. I got a surprise care package from my friend and fellow blogger, Judson. Judson writes the blog "My Cardboard Habit" and has been a good friend for several years, now. He surprised me with two really nice Chris Davis cards. 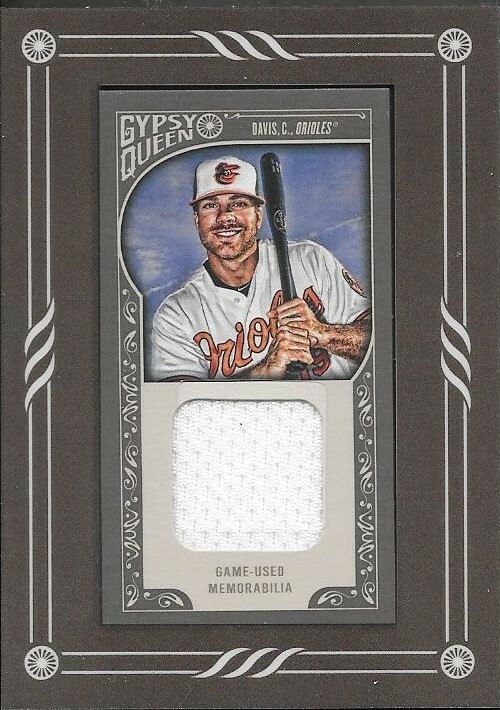 Judson sent along the Davis commemorative coin card and this 2015 Gypsy Queen mini framed relic. I really like the cards, and I appreciate the thought, Judson! Thank you so much for the surprise care package. 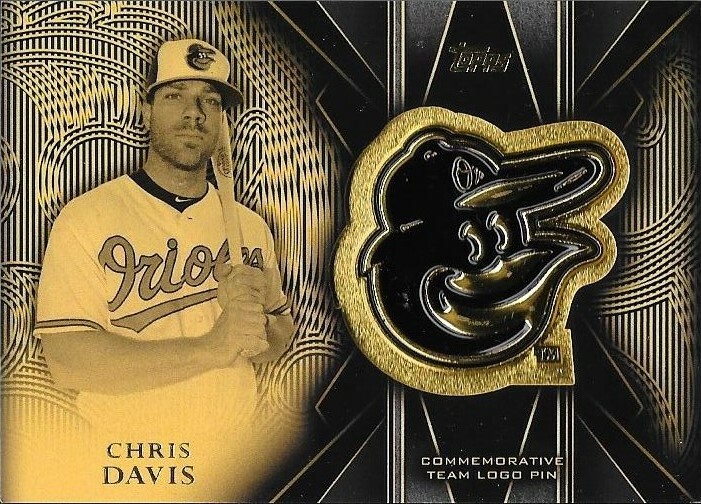 A few months ago, I did a deal with my buddy, Nick S. that landed me a sweet Mark Prior patch card (which will be going in a deal to my buddy, Max) and also this Chris Davis commemorative team logo pin card. The design of this card is really nice and I'm glad I didn't have to give up much to get it. I don't remember what I sent Nick, but I feel like it was a couple Bowman autos. Thanks so much for the deal, Nick! I was surprised to get a package in the mail from my good friend, Ryan. I counted 50 cards for my set, which really helps make a dent! I want to finish this thing out one day, and I believe that I can. I was able to be patient and finish the Brooks Robinson letter patch set, so I know anything is possible in cards. Except for rainbows. Rainbows are impossible. Thank you so much for the huge stack of cards, Ryan! I really appreciate it! I love these Leaf Trinity auto cards. I have a few of them now, and always enjoy finding more. I got a message from my friend, Dugan, recently and made a quick and easy deal to land this DJ Stewart. 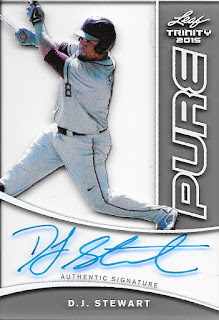 I traded Dugan a Bowman Chrome auto of Ruddy Giron from this year in order to get the Stewart. Stewart has yet to live up to his potential as a first round draft pick. 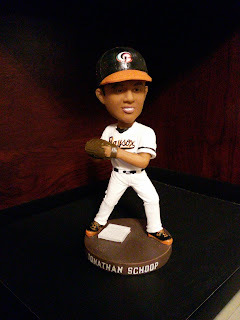 He was promoted to Frederick this season, even though his numbers at Delmarva weren't all that impressive. He ended the season with 105 hits, 10 home runs and a .254 batting average. 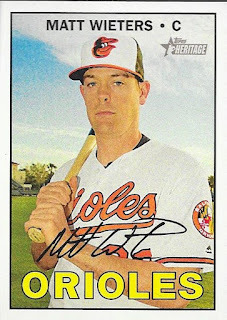 He was supposed to be a power hitter, but has yet to really demonstrate that in the O's system. My hope is that he can work through it and re-establish himself during the 2017 season. Thanks so much for the trade, Dugan! I love the card. I just watched a long drought in sports take a major dent tonight when the Cubs won the National League Pennant for the first time since 1945. I couldn't help but think of my good friend, Max, who is a huge Cubs fan, and lives in Chicago. He is an amazing guy, and deserves the amazing season that this team has given him so far. I truly hope to see the Cubs win four more games so Max, along with Eddie Vedder, Bill Murray, etc etc etc can celebrate a World Series victory. COngratulations, Cubs fans, this is a fun team to watch! Fun fact, Wrigley Field opened in 1914 and the Cubs have played there since 1916, eight years after their last World Series victory. This makes it by far the oldest baseball stadium to not hold a World Series Champion. 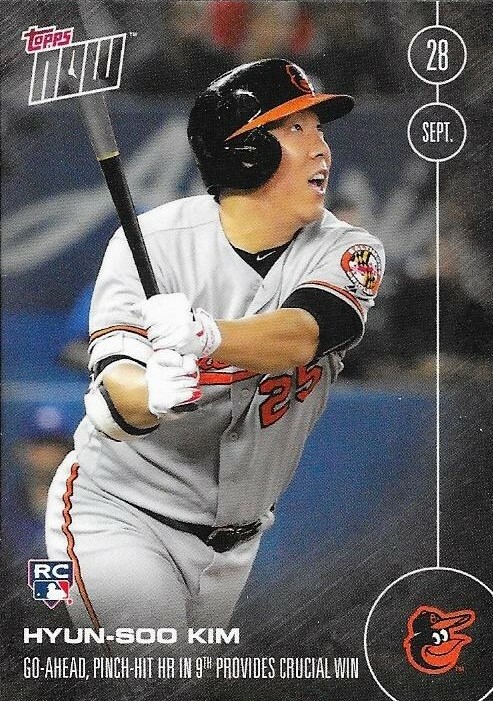 I have had a slew of Topps Now cards coming in lately, and I was happy to get this Hyun-Soo Kim rookie card in first. 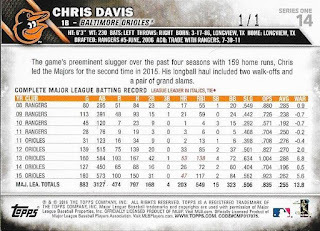 His pinch hit home run was probably the biggest hit of the Orioles season, and it came from the most unlikely of sources. Kim was asked to take a demotion upon the completion of Spring Training since he had a horrible time at the plate in March. 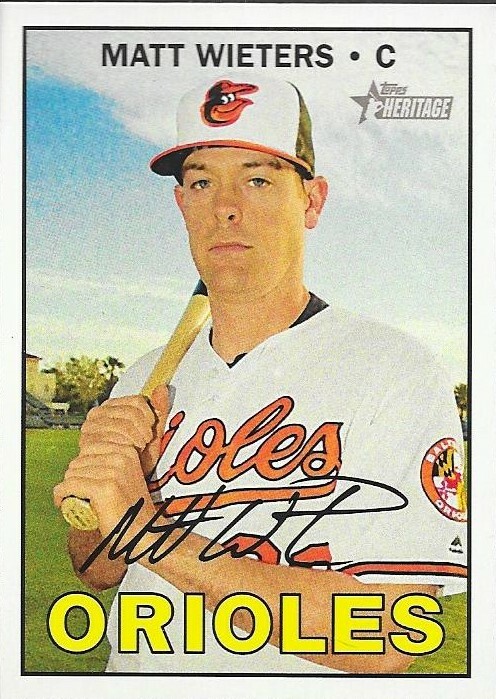 He refused the assignment, as was his contractual right, and remained on the Orioles 25-man roster. 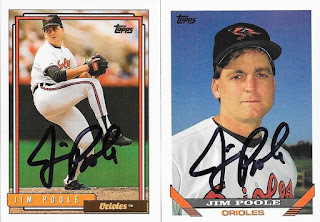 Kim ended up endearing himself to Orioles fans and completed his rookie season with 92 hits, 6 home runs and a .302 batting average. He won't win the Rookie of the Year award, but will definitely get votes. I wasn't sold on Kim at the beginning of the season, but I am happy that he is an Oriole, now. He really won me over! 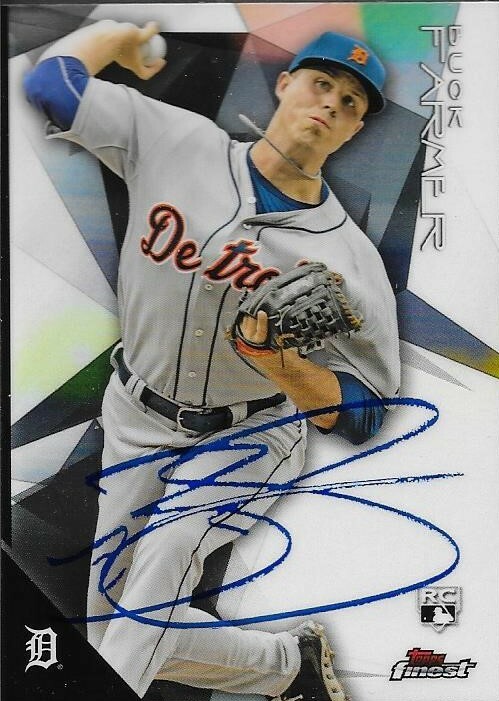 I received a TTM success from Tigers pitcher Buck Farmer yesterday after sending to him at Comerica Park on April 13. I don't normally send to active players, but I heard that Farmer is a pretty good signer, so I figured I would give it a shot. 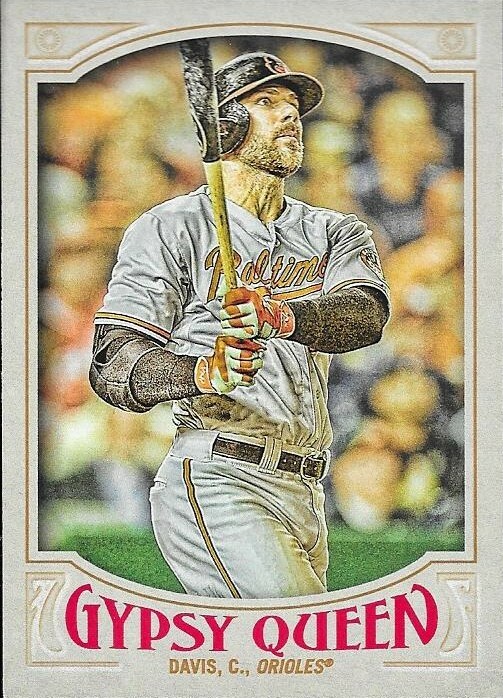 The above 2015 Topps Finest card turned out pretty nice, regardless of the beading of the ink. I liked these two offerings from 2015 as well. 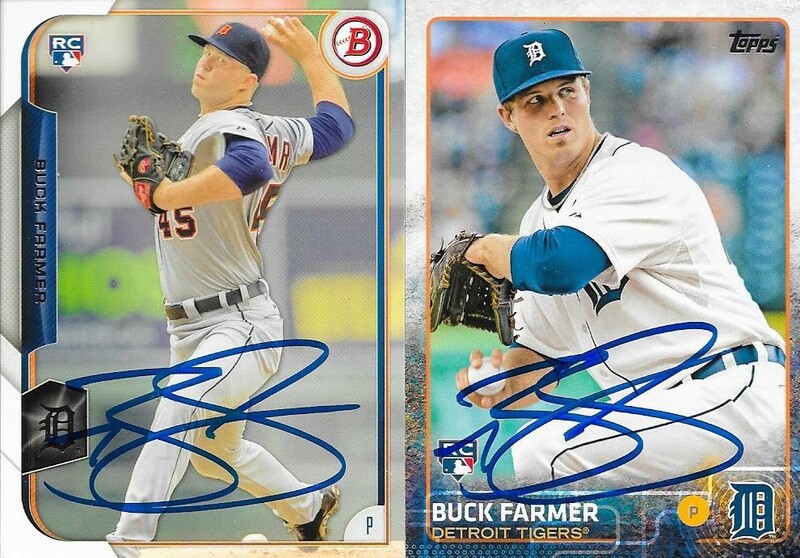 If I remember correctly, I found the 2015 Bowman right before I out the envelope together for the TTM, so it barely made the cut to be sent out. Farmer (b. 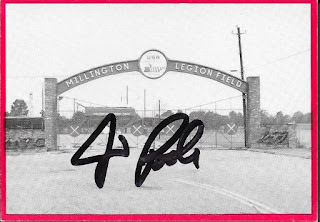 1991) has played in the majors since 2014 for the Tigers. So far, he has pitched in 32 games, but has yet to register a win. He is 0-6 with a 6.84 ERA and 62 strike outs. I wonder how long of a leash he will have in the majors if he keeps carrying that high of an ERA? I mailed to Farmer on April 13 and got the cards back yesterday, for a 188-day TAT. 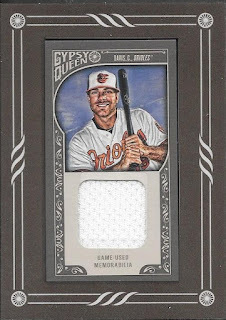 Recently, on EBay, I found this ridiculous patch card of Chris Davis at a really good price, so I pounded on it. 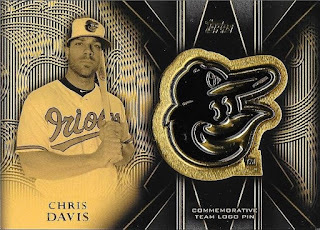 It is numbered 2/3 and features the Maryland Flag patch from the Orioles' jersey sleeve. 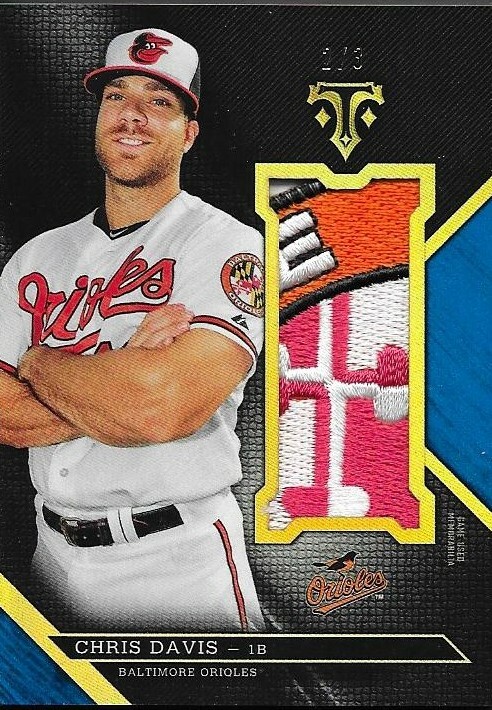 I still contend that the Orioles have some of the best patches on their jerseys, which make some of the bast patch cards. 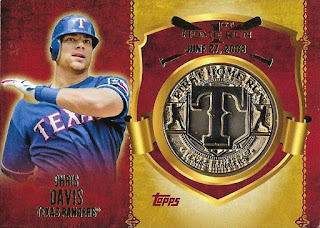 The Triple Threads product itself is still one of Topps best offerings of the year, and I really liked this year's design. I also like that the photo of Davis shows off where the patch came from. That's pretty cool! I meant to post this yesterday, but I was out of the house from 6:15 AM to 1:15 AM, and when I got home, all I wanted to do was go to bed. Also, these cards kind of got shifted around on my desk, so they ended up not being posted when I got them, so this is long overdue. My friend, Dilan, has helped me out by doing some 50/50s at Durham Bulls games this past season. I sent him a bunch of Bulls cards, and he got me a few signed back in June, but I told him to hold the rest until the end of the season. You know, just in case he was able to get more. So, he was able to get some more signed, and the top two are of a guy I have followed a little bit. Richie Shaffer went to high school in Charlotte with my good friend, Corbin. 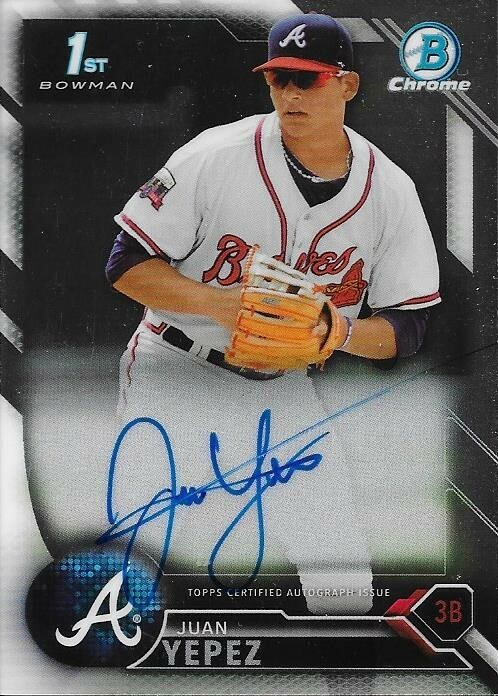 I have followed his career since he was drafted and am happy to see that he has made it to the majors. 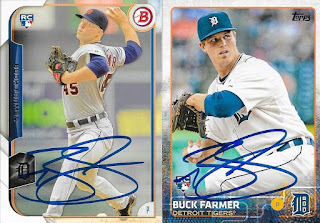 I was also glad to be able to add a couple 2016 Topps and Bowman to my album. 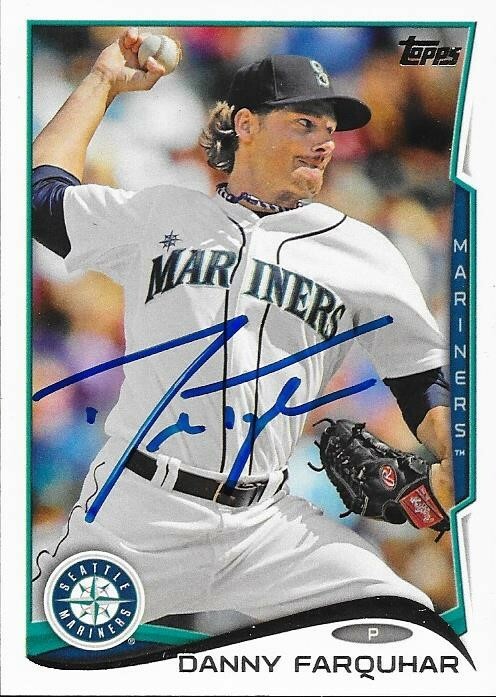 Finally, Dilan hooked me up with this 2014 Topps Danny Farquhar. Here is another guy who has been in the majors, but was at Durham at the time. Dilam also sent me back the extra cards that he wasn't able to get signed. I'm hoping I can get him some more stuff for next season, when rosters are announced. 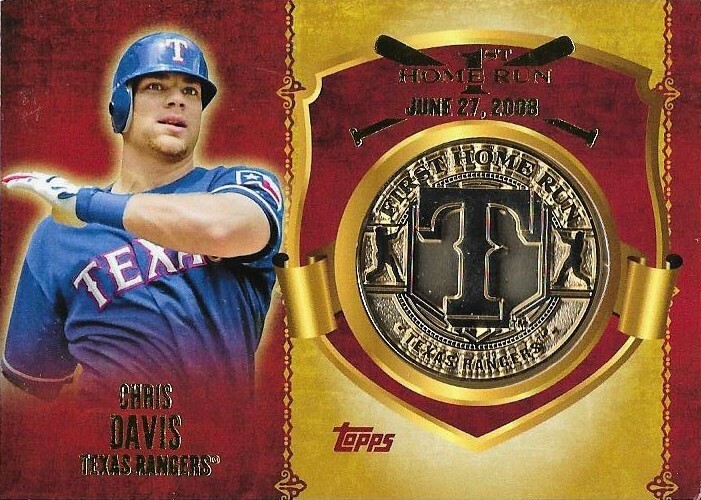 I just so happened to be looking at Ebay the other day when I saw that I had a Chris Davis 1/1 on my home page. 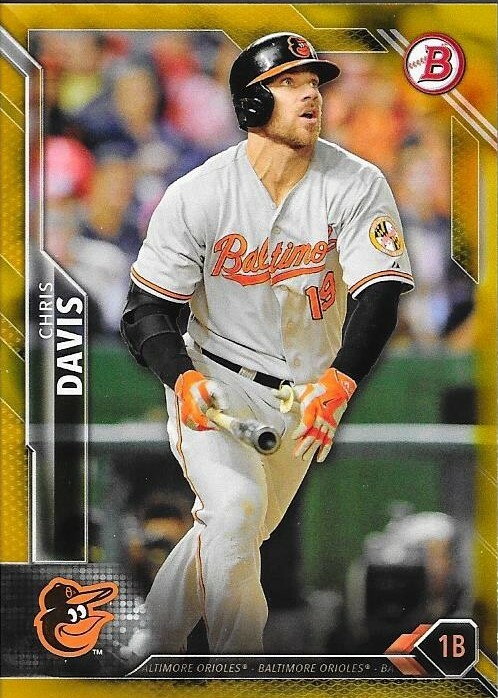 I have Chris Davis 1/1 saved in my searches but for some reason, I didn't get a notification. 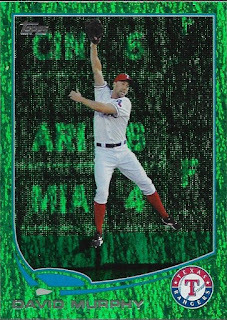 For $49.99, I was able to jump all over this platinum parallel from 2016 Topps Mini. 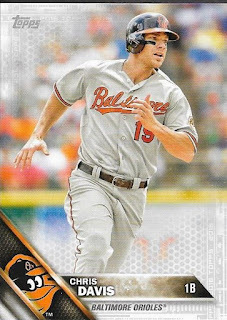 I have been wanting to get a few more Chris Davis platinum 1/1s so I may have a chance at a rainbow someday, so, I was glad to pick this one up. Money still has been tight since the National has come and gone, but following the advice of my good friend, Scott, I would have regretted letting this go. Luckily, I won't have to worry about missing out on this card. I was approached through Instagram DM by a kid named Seton about whether or not I was interested in purchasing some of the IP autos that he had for sale. I really wasn't all that interested, but the kid was really persistent. Finally, I reluctantly picked up something he had in his cache of autos since he really needed the money. This 2010 Topps Gold Chris Davis did turn out pretty nicely. 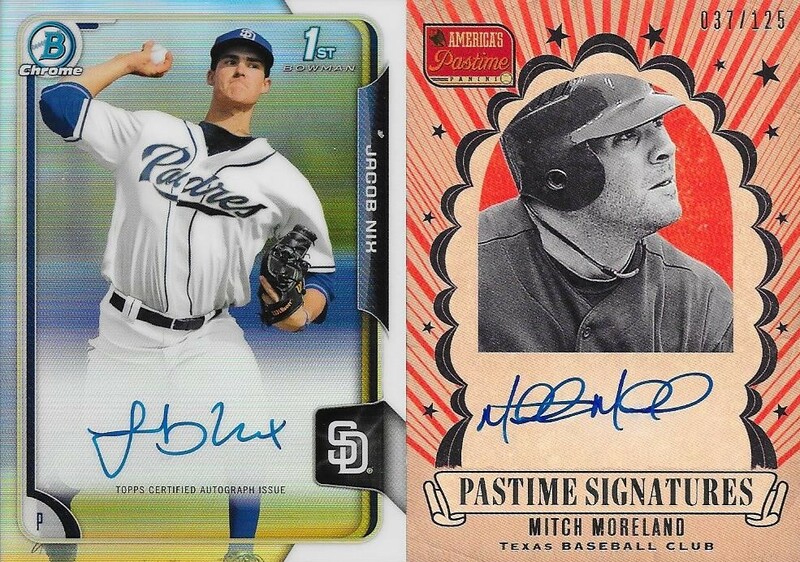 I figured it would look cool in my IP/TTM album alongside the other autos I have. Seton turned out to be a pretty cool guy. I felt bad blowing him off so many times when he was trying to sell some stuff, but since the National, I really haven't been able to pick up a whole lot of stuff. He and I chat often and I try to help him out since there have been quite a few people who have been really rude to him due to his strong beliefs. I'm not one to judge people, so I definitely want to be friendly. Thanks for the deal, Seton! I Won A Topps Giveaway, Again! A couple months ago, I won a giveaway posted on Topps's Instagram page. 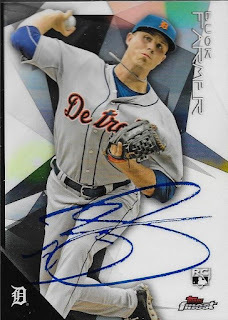 The giveaway was for a box of Topps Strata. Little did I know, I would win again the last day of the National. I was nominated this time by my little buddy, Nick C., who I have done some trades with and also met at the National. He messaged me that Sunday night to let me know that I had won and had I seen that Topps tagged me. I never got the notification... because they misspelled my name in the tag! They were supposed to tag my Instagram account (wregenthal) but accidentally tagged (wregental). So, I never got the notification. The plot thickened, though, when Nick showed me that someone had created an Instagram account with the name, and had pulled a couple of my posts from the National and posted them on their page. I was confused, so I messaged the person to let them know that I didn't appreciate them creating an account that was so close to my name. My fear was that they were planning on scamming a few people based on the reputation that I had built these last few years. I was up til 1AM messaging this kid back and forth. 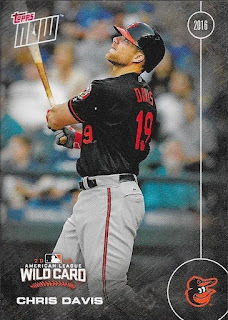 I also was getting notifications from members of the card community who were tagging me in posts on Topps's page explaining that they had misspelled my name, and the person created a fake account so they could claim the prize. Frustrated that the person wasn't budging on closing the account, I went to sleep. I woke up the next morning to a huge apology message from the kid asking for my forgiveness for trying to deceive Topps. It seems that they messaged him themselves and told him the he would not be winning the prize. Worst of all, this is a 14-year old kid. I accepted his apology and gave him a few words about how he should work to conduct himself better in the community. We chatted for a while, and he seemed to be a decent enough person. So, I gave him some collecting tips, checked out the card videos he posted on his card page and actually completed a trade. It wasn't long after the trade that he disappeared from the community, but not before pretty much messaging me out of the blue and telling me he didn't want to talk or do any more trades. I decided that I would move on, because I felt like I had done plenty to help the kid, and didn't need to extend a hand in helping him any further. My hope is that one day, he will grow up and realize that he was really lucky that I showed him some compassion and forgiveness for his mistake. I definitely didn't have to! So, I did get the prize from the giveaway. 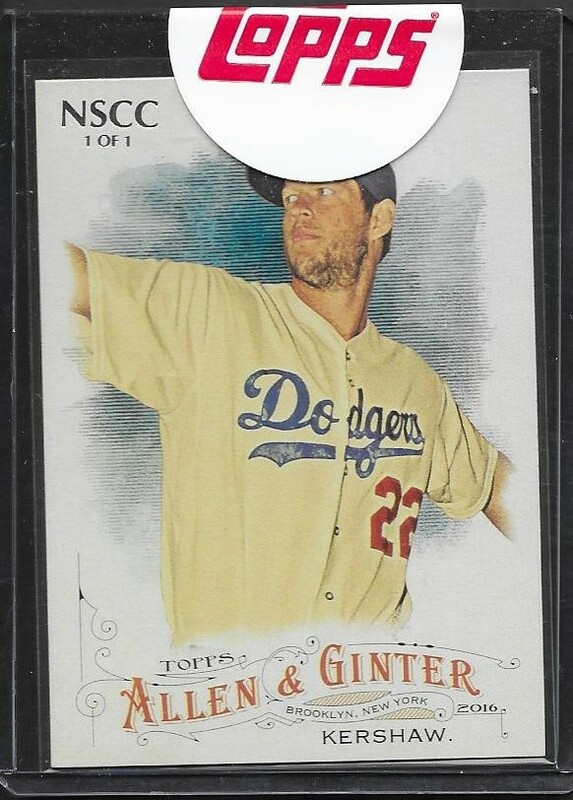 This realy cool 2016 Allen & Ginter Clayton Kershaw National Exclusive 1/1. I have had a few people ask if it was available, but I think that I am going to hold onto it. 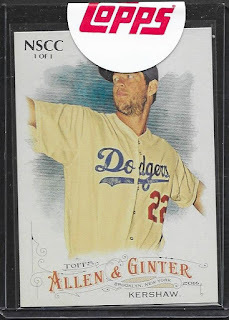 One, because Kershaw is a badass, and two, it will serve as a reminder that the community backed me up 100%. I am really appreciative that so many people (and quite a few of them I had never even talked to) messaged Topps to try to fix the problem. 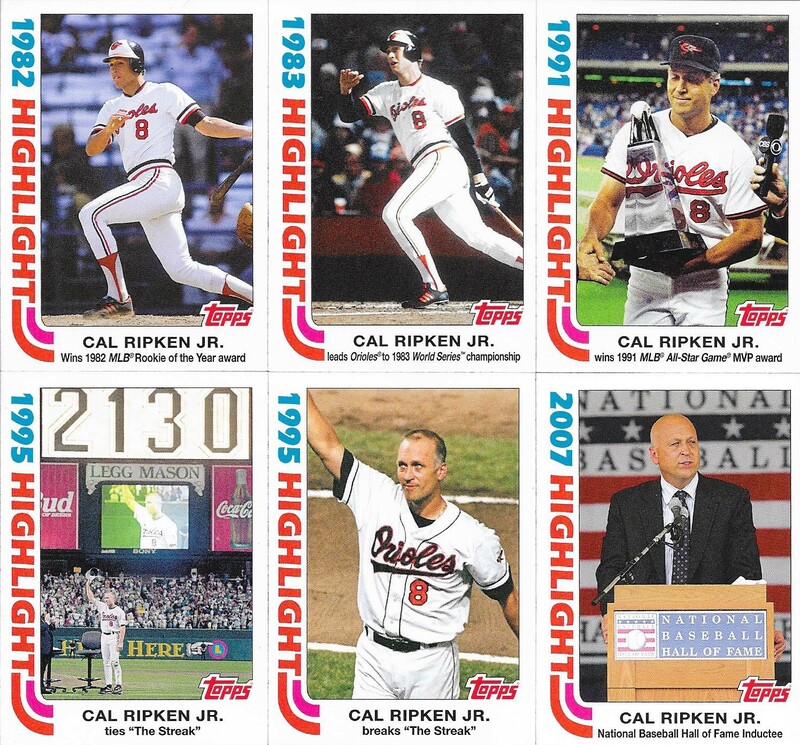 21 years ago this past September 6, Cal Ripken broke a record that was said to be unbreakable. 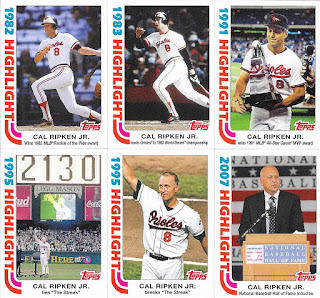 This year, Topps did an online exclusive promotion to commemorate Cal and his accomplishments. Since I have been really satisfied with my recent purchases from Topps.com, I decided to pick up the Cal set for my PC. The cards are pretty thick, a little more than a Heritage card. They all look great and got here really fast. The set features key moments from Cal's career, as you can see. I kind of wish there were more than the six cards, but they are great nonetheless. I really enjoy the exclusive content on Topps's website. I have a few Topps Now orders pending, so be on the lookout for those posts. I was enjoying the playoff games today so much, that I almost bypassed doing a post tonight. Mail didn't run today, due to Columbus Day, but with all of the flooding in this area, I doubt it would have ran anyway. So, I wanted to show a card that I got as a gift recently while I was having a lunch meeting with my client and friend, Neil, and his brother, Mike. We met at a BBQ restaurant in Kinston and talked baseball for a little while. 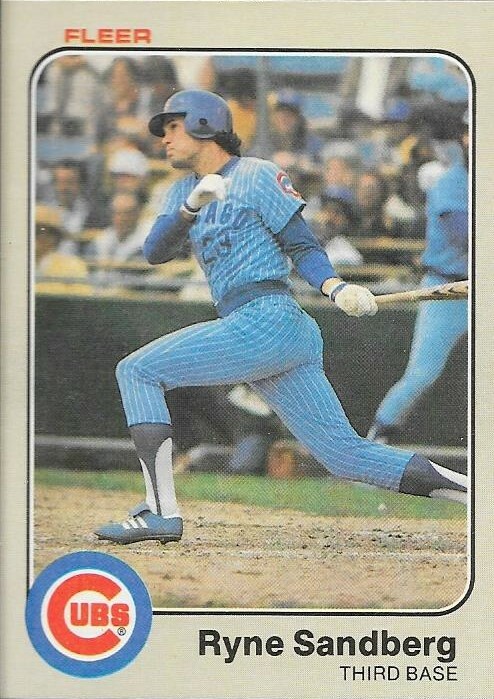 Neil surprised me at the outset of the meeting with this really nice 1983 Fleer Ryne Sandberg rookie card. I actually bought one of these from a bargain bin at the National, but it was a gift for my little buddy, Max/ Now, since Neil gave me this one, I can have one of my own!! I really appreciated the gift, Neil! It will go with my other Hall of Fame rookies! 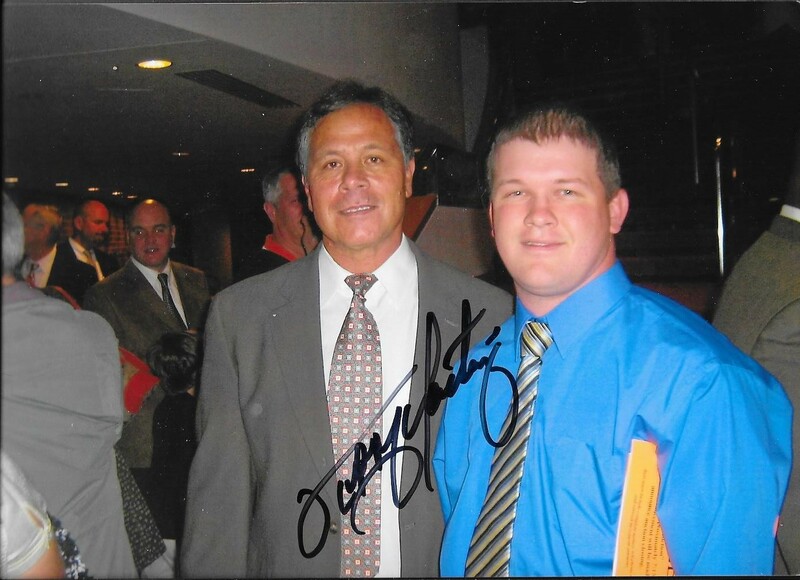 I was able to send off a 5x7 photo for a TTM, along with some cards to former Orioles reliever, Tippy Martinez. I got the photo signed and four of the five cards that I sent, signed. 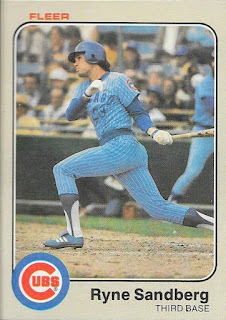 One of the cards, a 1978 Topps appeared to be stuck to one of the others, so that is probably why he didn't sign it. This photo is from the October 2009 "Evening With Brooks" event that I attended with my brother, Andy. We met Martinez, Chris Hoiles and Brooks at the event. I now have my photos with Martinez and Brooks signed. I need to get my photo with Hoiles signed as well. The photo turned out pretty well, I think. I was able to get two Topps and two Fleer cards signed. They are: 1977 Topps, 1983 Topps, 1985 Fleer and 1986 Fleer. Martinez (b. 1950) played in the majors from 1974 to 1986 and 1988 for the Yankees, Orioles and Twins. He had a career record of 55-42 with an ERA of 3.45 and 632 strike outs. 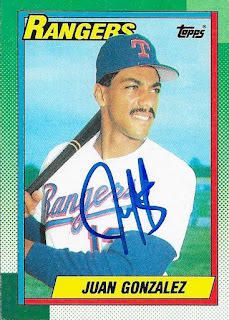 He was an All Star in 1983 and finished 27th in the AL MVP voting. He won the World Series with the Orioles in 1983. 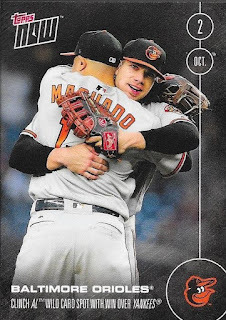 I mailed to Martinez on September 27 and got the cards back on October 7, for an 11-day TAT. I anticipated that I would have a lot of free time today due to Hurricane Matthew passing over us. I was right, so I picked up a box of 2016 Topps Heritage High Number from my LCS and wasn't disappointed. 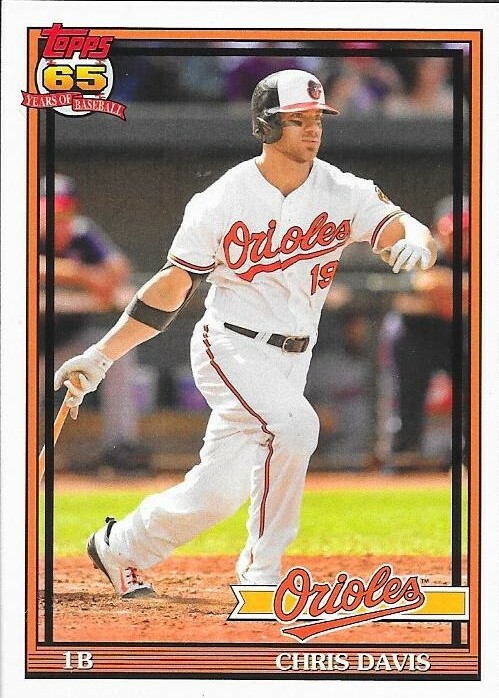 There were a bunch of Orioles in the box, including Nolan Reimold, which was nice to see. 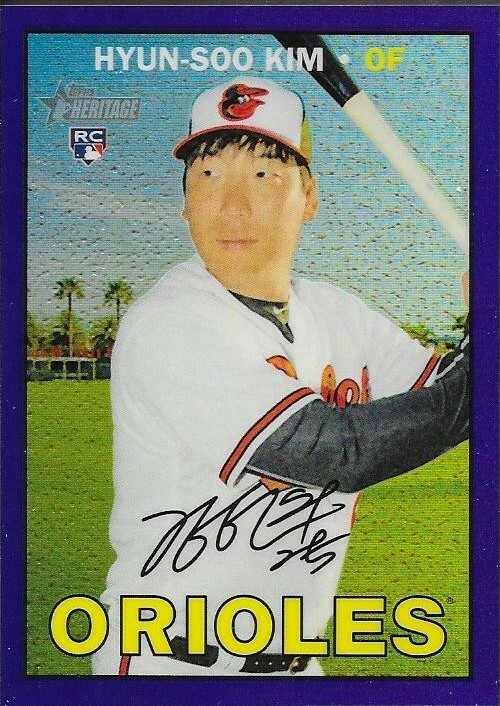 I also pulled this purple chrome parallel Hyun-Soo Kim rookie card. The purples were one per pack and are not numbered. Something else cool about the set is that Matt Wieters makes an appearance, a first for any Topps product that isn't an online exclusive. 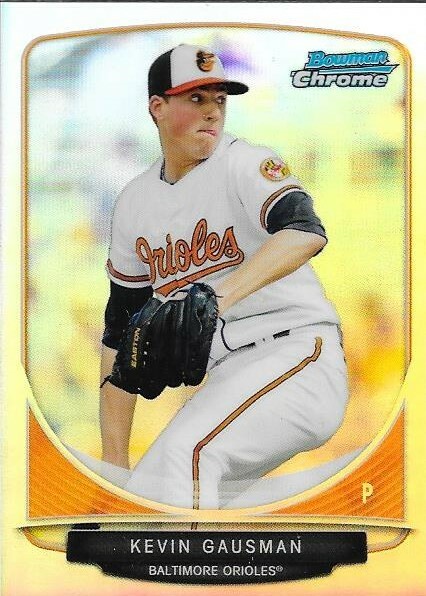 Even though his time with the Orioles may be over, it is nice to finally be able to add some of his cards to the collection that are under the Topps brand. I know Panini and some of the other companies are nice and all, but baseball cards just aren't right without the Topps logo. 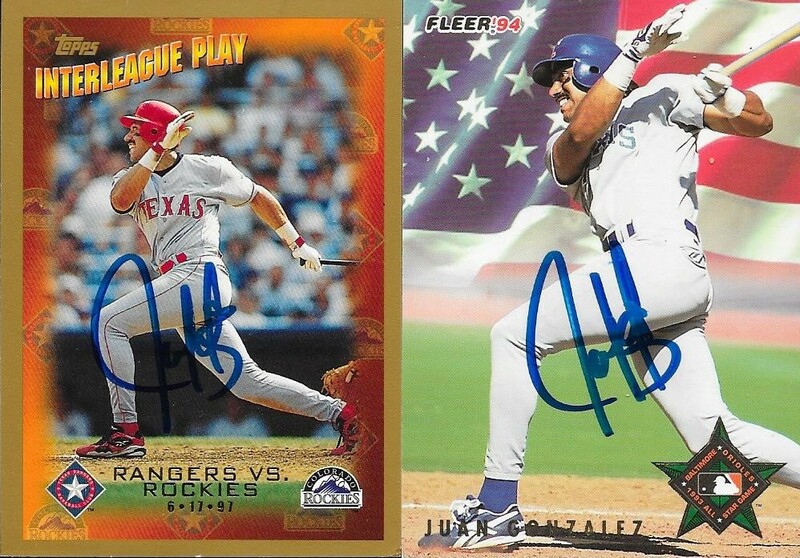 My box also had one hit, which was an Albert Pujols relic card. I am sending that along to my good buddy, Andrew, who PCs Pujols. I also ended up with a Marcus Stroman action SP, a couple high number SPs and a Tim Lincecum as an Angel card (which went to Chris). One of my favorite parts of going to the National is the ability to meet up with fellow collectors from Facebook, Instagram, the blogs, Skype, etc. I have used it as an opportunity to do some in person trades with these guys, and just hand out searching boxes with guys who are just as interested in cards as I am. One of the people I was able to meet with at this year's National was Matthew. I met Matthew through a Facebook trading page several years ago when he was only 10. I believe one of the first trades I ever actually completed with him was for a Jose Fernandez chrome RC (but Matthew may have to confirm that). I helped him get his collection started by also sending him some care packages and introducing him to blogging and other Facebook card pages. Matthew actually started a few of his own trading pages and would Skype regularly with my son, Chris, since they are really close in age. It stuck with Chris so much, that he asks about Matthew all the time, even though the don't have the time to chat any more. So, I met up with Matthew and his dad at the National and he had this great Hunter Harvey auto from 2015 Bowman Inception. He gave me the card "just because" which I thought was really nice of him. I always enjoyed how appreciative Matthew was of the care packages I sent. I now see his instagram page and enjoy all of the super high end cards that he has acquired since our introduction. I'm happy to see that his collection has grown by leaps and bounds, and also how he himself has grown into a well respected member of the card community. I see articles all of the time that spell the death knell of the hobby, but with kids like Matthew, I feel like it is alive and will carry into the next generation of collectors just fine. Thanks so much for the awesome card, Matthew! 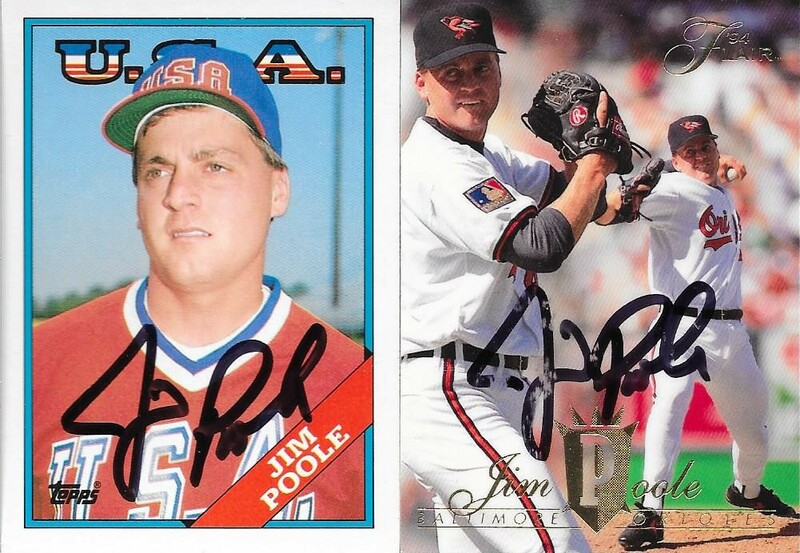 I got a great TTM success in today from a baseball star that I paid a lot of attention to when I was growing up. 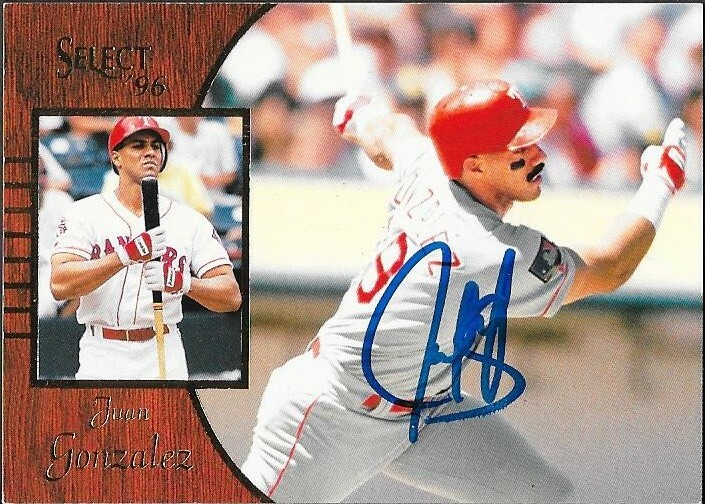 Being a baseball fan in the 90s, you knew who Juan Gonzalez was. He was one of the biggest stars of the decade and when I saw that he was signing TTM, I jumped all over it. I went through all of my card boxes and pulled out a huge stack of his cards. I then culled them down to just 5 that I thought would look cool signed and/or ones I would have liked to have seen in my auto album. This 1995 Studio Gold card was the #1 card that I wanted to get signed. I didn't have any in my auto album yet, and this was one of my favorite sets from back then. The concept was pretty cool, and still looks pretty good today. The card turned out great signed; I couldn't have asked for it to have turned out better. This 1996 Score Select turned out really nice, as well. This was a premium product back then, and I actually had forgotten about it until I found this in one of my boxes. The wood grain design always looks good on a card, so I think that is what pushed it to the front of the line of cards that I picked. 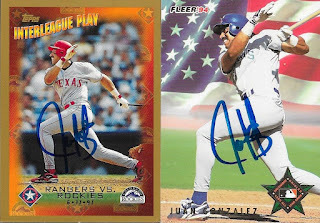 I had a bunch of the 1998 Topps Interleague Play cards, and I thought it looked pretty cool. The 1994 Fleer Ultra is especially cool with the American FLag background, but if you look closer, it has the 1993 All Star Game logo when the game was played at Camden Yards. I had to add that to the TTM request for that purpose alone! Finally, while looking through the boxes, I found this 1990 Topps Gonzalez rookie. I figured that would top everything off, so I added it to the pile. I was tempted to add a sixth card, but in the end, I relented since I didn't want to push my luck. I am really happy with how everything turned out. Gonzalez (b. 1969) played in the majors from 1989 to 2005 for the Rangers, Tigers, Indians and Royals. He had 1,936 hits, 434 home runs and a .295 career batting average. He was a 3-time All Star and 6-time Silver Slugger Award winner. He was the AL MVP twice (1996 and 1998). He hit 40 or more home runs five times. He batted .310 or better five times as well. He appeared on two Hall of Fame ballots (2011 and 2012) but only received as much as 5.2% of the vote before receiving 4.0% that dropped him off of the ballot in 2012. Gonzalez on paper looks like a sure-fire Hall of Famer, but being mentioned in the 2005 Mitchell Report and also Jose Canseco's book as a steroid user. This is the reason why he barely got a sniff of any Hall of Fame votes. I doubt he ever gets in, but if some of the other known users get in, maybe he will have a chance in the future. I mailed to Gonzalez on September 26 and got the cards back today for an 11-day TAT. I got a one-card care package from my friend, Jeff, who goes by the name @green68camaro on Instagram. 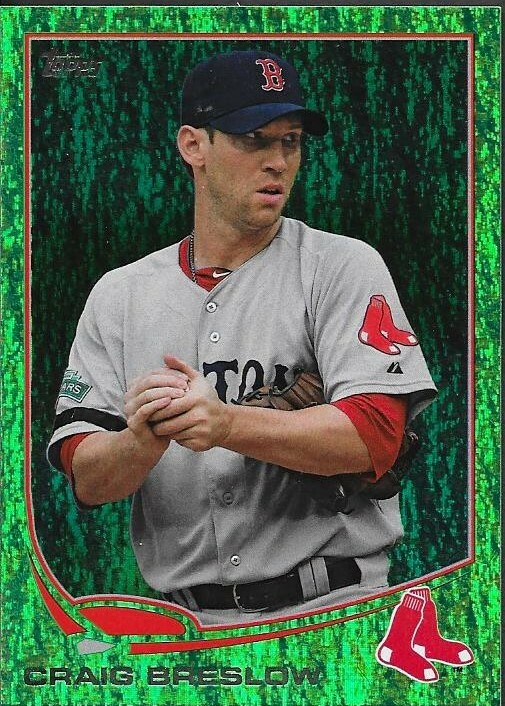 He had found this 2013 Topps emerald parallel that I needed for my set. I haven't forgotten the set, I just haven't done a whole lot with it lately. I still have a log way to go on it, but I'll hit it on sportlots sometime soon and chip away. Thank you so much for the card, Jeff, I really appreciate it! Tonight the Orioles' 2016 season comes down to a one-game playoff against their division-rival, the Blue Jays. They fought tooth and nail to hold onto a wild card spot for this chance and can continue on into the ALDS if they can pull out a win tonight. The Orioles won the first wild card play-in game in 2012 against the Rangers, and that is who they will play if they can move on. I suggested yesterday afternoon that the Orioles should start Ubaldo Jimenez but they opted for Chris Tillman. I can't believe I suggested Ubaldo. Just a few months ago, I was one of the many Orioles fans who were calling for his release. He has had a rocky tenure with the birds, but has really come on in his last 7 starts. I'm no fan of the Blue Jays. I don't like Jose Bautista at all, and I didn't like their wooing of Orioles GM Dan Duquette last off season. There is a bit of bad blood between the two teams, albeit nowhere near that of the Rangers and Blue Jays. It will be interesting if Darren O'Day pitches against Jose Bautista in the later innings tonight. So, I will watch the game with a lot of apprehension. I don't want my guys to lose. I feel like they can pull it out, but I always worry. I hope they win it. I'd love to see the O's bats erupt and Tillman throw a gem. That would really be awesome. Anything can happen in the Post Season, right? I got this 2016 Bowman Chris Davis gold parallel off of Instagram from a guy named @lonestargraphs. I sent him some quick Paypal and got the card. I already had one, but since they are numbered, I didn't mind picking up another. This one is numbered 33/50. So, I'm off to watch the game. Thanks to everyone who messaged me good luck wishes today. It really meant a lot to me! Kevin Gausman delivered in what might have been the biggest game of his career yesterday. He held the Yankees to two runs in 7.1 innings pitched and his battery mate, Matt Wieters supplied the lumber in the Orioles 5-2 win. The Orioles win assured them of a spot in the 2016 Post Season; before the Tigers lost to the Braves. Gausman has seemingly turned the corner in his progression as a former top prospect into a top of the rotation starter for the Orioles. 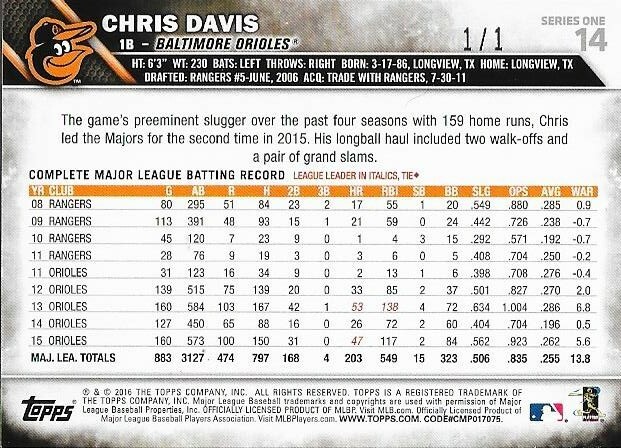 His won-loss record isn't spectacular by any means, but he suffered from a lack of run support throughout the season. He still managed a 9-12 record with a 3.61 ERA and 174 strike outs this season. Not too bad, really. I only picked up two Gausman cards from the National (I don't count the Museum Collection card since it went into th Davis PC). The card at the top of the page is a 2013 Finest orange refractor numbered 88/99. The above card is a mini refractor from 2013 Bowman Chrome. I hope that the Orioles can continue their season beyond tomorrow night, but they have to go through Toronto first. Let's go O's! A couple things before I begin this post. I passed 500,000 page views yesterday. That's pretty significant, so I would like to thank you all, and all of the bots clicking on my blog and maybe giving it a read. I don't respond to all of the comments, but they are appreciated and I encourage you all to continue. Thank you so much! Also, I dusted off my lucky 2005 Brian Roberts jersey for today's game. I figured there may still be some magic left in there after I called his walk off homer in the June 28, 2005 game. The Orioles need to win today to assure themselves of a playoff spot. An Orioles win and Jays and Tigers losses would give the Orioles the Wild Card game at home. I really hope they can win. I still have tons of stuff to show off from the National. I believe I will be posting about the National up until Christmas. I lumped all of the Chris Davis PC pickups into this one post because I didn't really find too many cards of him that really stood out. Of course, there was the one Museum Collection quad that warranted its own post. These were just a few base and parallel cards I needed but hadn't pulled or picked up yet. 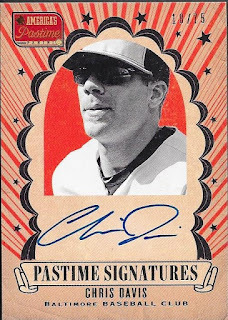 I did find the Panini America's Pastime auto at the top of the page in a discount box for $5. 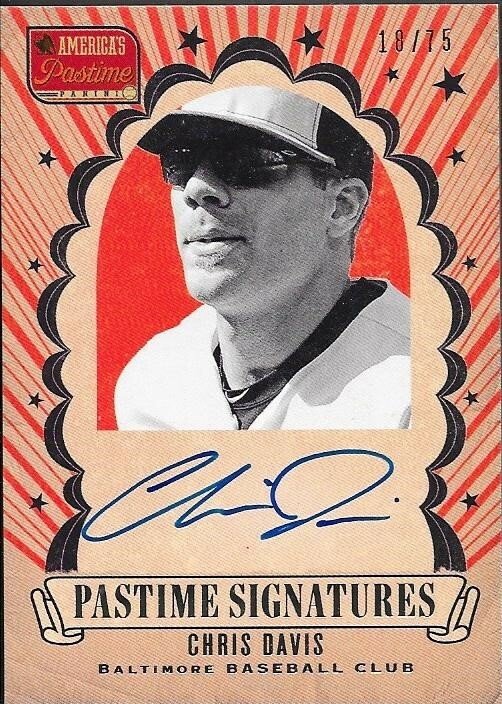 It is an on-card auto and is numbered 18/75. 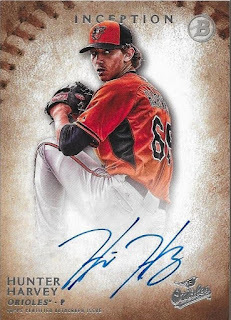 The above 2016 Topps Archives is nice, but I really want to find the Desert Shield parallel. I looked around the show while I was looking for the Cal, but didn't locate one. I liked this year's Gypsy Queen. I wasn't sure I had Davis's base card, and I couldn't access my inventory list since my phone dropped dead at the show every day, so at a dime, I didn't mind picking this up. 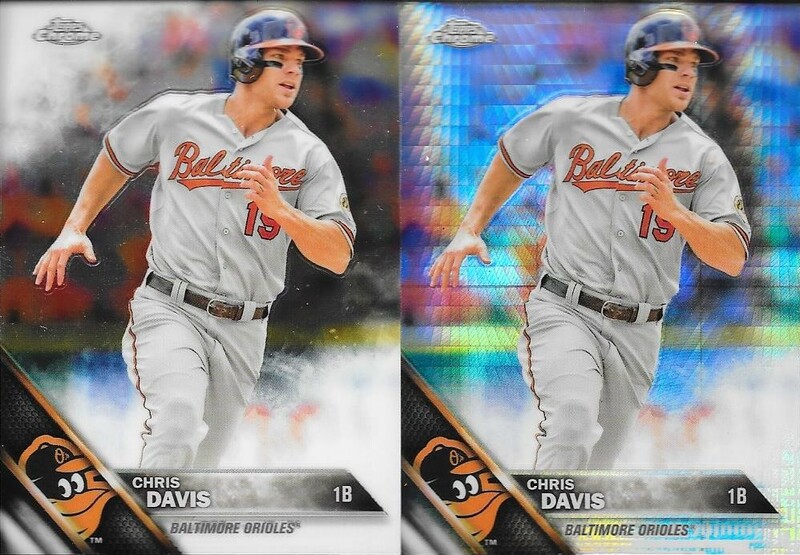 Finally, 2016 Topps Chrome had just been released prior to the show, so I didn't have any of the Davis cards yet. 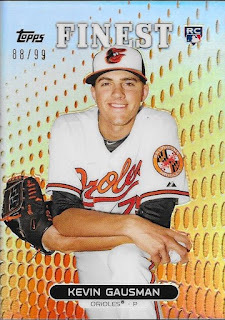 I found a guy who had busted a case and took his Orioles for a cheap bulk price (that included the Joey Rickard auto I posted earlier). I was wondering a few days ago why I didn't have them listed in the inventory list. Now I know why; I hadn't posted them yet. 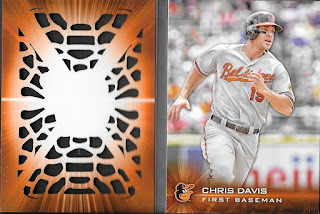 I looked all over the National for a Chris Davis 2016 Topps Laser Booklet card, but no one had any. One vendor had some of the other players in the series, but not Crush. I later found one on Ebay for only $14.50 shipped. I had seen others going for closer to $30 and figure that they would have been selling pretty high at the National, so I was glad to get this one at that price! These are really cool cards. Not numbered, of course, but still tough to pull out of packs. I opened three jumbo boxes of Series 2, but only pulled two of the laser booklets. 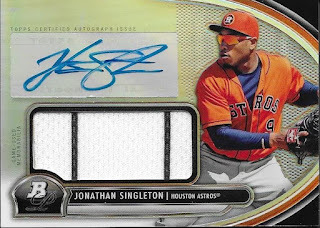 One was a case hit (auto patch) as well!